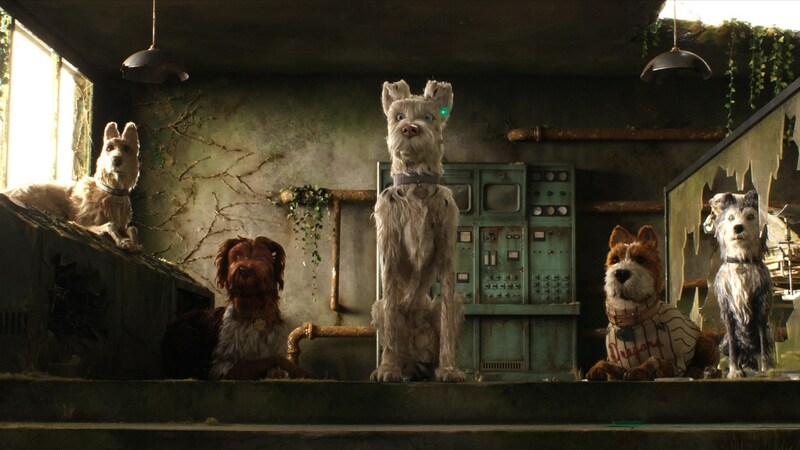 Isle of Dogs, the opening film of this year’s Glasgow Film Festival, sees Wes Anderson returning to the stop motion style of filmmaking, which he had previously incorporated into 2009’s Fantastic Mr Fox. Set in a future dystopian Japan, an epidemic of ‘canine flu’ has spread. To combat this, all dogs have been quarantined to the remote ‘trash island’, an offshore landfill. The film focuses on a pack of dogs, led by Chief (Bryan Cranston), who agree to help a boy named Atari who has crash landed on the island in the hope of being reunited with his own dog Spots. The group are then pursued by Japanese authorities intent upon catching Atari by any means. Wes Anderston’s style is immediately identifiable, no matter which of his films you might be watching. He has a very linear approach to his directing, utilising steady shots and fluid camera movements to ensure everything stays well-placed in frame. This style accompanied his adaptation of a hectic Roald Dahl book surprisingly well, and it does so again here, as the film’s charming clay models merge seamlessly with Anderson’s style. While the way the film’s canine characters move does look a little unusual at times, life nonetheless radiates from the models, assisted by the film’s unique cinematography. Many of Anderson’s usual tropes are present in Isle of Dogs, as both his usual incredible plethora of actors (including Bryan Cranston, Edward Norton, Bill Murray and Greta Gerwig among many others), and his dry sense of humour are on full display. Yet, one can also admire the creativity on display, both in its premise and in its storytelling. The story humorously weaves both the main plot, concerning the journey of Atari and his canine companions, with over-the-top subplots, including a government conspiracy, keeping the pacing eccentric and kinetic throughout. The production design, the attention to detail with its animation and character models, and the comedic banter between the characters, as well as between the filmmakers and the audience, maintains engagement and entertainment, making for an overall fun experience. Truth be told, it’s another quintessential Wes Anderson film on display, therefore those already familiar with the director’s work should already know roughly what they’re going in for. Isle of Dogs has plenty of enjoyment to offer via its fantastic animation, imaginative setup and mix of deadpan and over the top deliveries. It’s unlikely to especially challenge any preconceptions of the director and his style, but it’s nonetheless an entertaining spectacle with much to admire. More information about the Glasgow Film Festival, including a full list of upcoming events and screenings, is available here.